Negotiations were under way between RCMP and hereditary chiefs of the Wet’suwet’en Nation Tuesday night, aimed at finding a “peaceful solution” to a standoff that led to 14 arrests when police dismantled the first of two checkpoints set up to stop TransCanada Corporation’s Coastal GasLink fracked gas pipeline. The 670-kilometre pipeline, from the Dawson Creek area to Kitimat, British Columbia, would supply natural gas to the C$40-billion LNG Canada liquefied natural gas megaproject, an undertaking that could become  the biggest capital project in B.C. history and blow a massive hole in the province’s greenhouse gas reduction commitments. During the raid on the Gidimt’en checkpoint, some of the people at the station avoided arrest and retreated to the Unist’ot’en Camp 20 kilometres away. 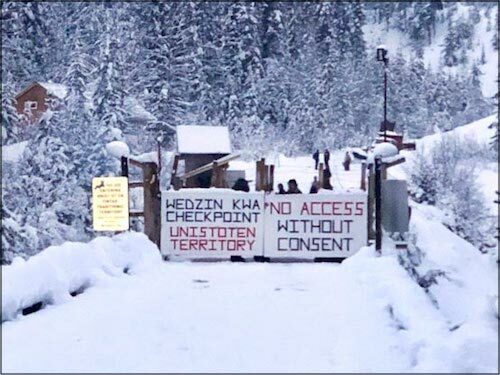 The Star Vancouver previously reported  that land defenders had retreated from the Gidimt’en checkpoint, about 65 kilometres outside the town of Houston, B.C. “I love waking up to the sound of a helicopter,” one defender said Tuesday morning. Wet’suwet’en Nation member Mike Ridsdale, environmental assessment coordinator for the Office of the Wet’suwet’en, said government and industry are not only ignoring the community’s legitimate environmental concerns, the Star notes. They’re also bringing shame to the chiefs they sought to work with—and the chiefs have a long memory. The raid and subsequent negotiations were triggered by a December 14 B.C. Supreme Court ruling that granted Coastal GasLink an interim injunction to remove the blockade. “Instead of removing it, opponents set up a second checkpoint, the Gidimt’en checkpoint,” the Globe and Mail reports . The paper explains that the Gidimt’en are one of five clans of the Wet’suwet’en, one of the First Nations involved in Delgamuukw v. British Columbia, a landmark case in 1997 that recognized Indigenous claims to ancestral lands they never ceded by treaty. “The provincial and federal governments must revoke the permits for this project until the standards of free, prior and informed consent are met,” Phillip said. Ahead of the RCMP action, a statement from the Unist’ot’en Camp called the raids an “act of war”, the Globe reports. “Yesterday, members of the RCMP’s Aboriginal Police Liaison met with Wet’suwet’en Hereditary Chiefs and indicated that specially trained tactical forces will be deployed to forcibly remove Wet’suwet’en people from sovereign Wet’suwet’en territory,” read the January 6 statement. Which might have spelled disaster for the $40-billion LNG Canada megaproject, which has enjoyed political support and lavish subsidies  from B.C.’s Liberal and NDP governments, and from the Trudeau Liberals in Ottawa. “Without a four-foot diameter (122-centimetre) pipeline feeding fracked gas to the marine terminal, the LNG Canada project is a non-starter,” Nagata writes. Which brings the focus back to all the talk about “reconciliation” and how to enshrine the United Nations Declaration on the Rights of Indigenous Peoples in B.C. law, when Article 10 of UNDRIP states that “Indigenous peoples shall not be forcibly removed from their lands or territories.” This week’s arrests are hard to reconcile with that basic right. “Pro-pipeline pundits are already working hard to spin this raid as the ‘rule of law’ being asserted over the objections of ‘protesters’. They point to benefit agreements signed between TransCanada and many band governments along the pipeline route,” Nagata notes. CBC and other media documented  protests in Ottawa, Vancouver, Smithers, Edmonton, Montreal, Halifax, rural Nova Scotia, Richibucto, New Brunswick, and Toronto. “The RCMP, proudly suppressing Indigenous rights since the 1880s,” read one sign on Parliament Hill.